We Need to ‘Slow Down’ When Teaching Writing is the headline of one of my Education Week Teacher columns. It finishes up a four-part series on teaching writing. I’ve published a number of posts on writing instruction, and thought I’d bring them all together into one “The Best” list. I’ve previously posted tons of lists sharing sites that are useful in writing instruction, but none collecting posts I’ve written about what to actually do in the classroom. I published a four-part series on teaching writing over at my Education Week blog. Here’s a link to the final post in that series — it contains links to the previous three, too. “Instead of seeing students as Far Below Basic or Advanced, we see them as learners” is a guest post written by my colleague Lara Hoekstra. Writing Prompts — Feel Free To Contribute Your Own! I’ve posted a collection of all my Education Week Teacher posts on teaching reading and writing. It includes contributions from lots of great educators. This Is Exactly What I Mean By Connecting Social Emotional Learning & Literacy Instruction…. Julie Goldman, the Coordinator of the great WRITE Institute that creates curriculum for English Language Learners, has written an excellent article on “Research-Based Writing Practices For English Language Learners,” which you can download for free here. 500 Prompts for Narrative and Personal Writing is from The New York Times Learning Network. How to celebrate students’ writing is from Ray Salazar. Micro Writing: Writing to learn in ESL is from ELT Connect. The Teacher Tip: Don’t Fix the Story. Just Listen. is by Barry Lane. Rachael Roberts – Motivating students to write is from The British Council. Learning to Write Like a Reader: Teaching Students How to Edit and Do Peer-Review is from Teaching Learning/Learning Teacher. 301 Prompts for Argumentative Writing is from The New York Times Learning Network. Constructive Peer Editing: Free Handout Included! is by Emily Guthrie. She shares such an obvious and easy improvement on typical peer-editing, you might feel as dumb as I did for not thinking about it before (that is, if you haven’t). Supporting Good Writing Instruction is from The National Writing Project. Is “Draftback” A Cool Toy You’ll Use Once Or Potentially An Effective Tool For Teaching Writing? Mindshift, the popular KQED blog, has published an excerpt from one of my books they’ve titled What Motivates A Student’s Interest in Reading and Writing. Concise and Precise Micro-writing is from Alex Quigley, and offers some very good suggestions. Adventures with gallery critique is by Andy Tharby. Modelling Writing and Rich Tea or Hob Nob? from Class Teaching both make great points and offer suggestions about the role of teacher modeling in writing instruction. Nine Ways to Help Students Embrace the Revision Process is by John Spencer. Writing Next: Effective Strategies to Improve Writing of Adolescents in Middle and High Schools is a very useful report suggested to me by reader Marie. Dylan Wiliam advises: Forget the Rubric; Use Work Samples Instead is a pretty important post by Doug Lemov. Be sure to also check out Dylan William’s comment on it. School Writing Vs. Authentic Writing is by Ken Lindblom. At First Glance: A Sentence Starter Adds Unexpected Rigor to Writing and The Art of the Sentence are both by Doug Lemov. How I Teach My English-Language Learners to Love Writing is by Mary Ann Zehr and appeared in Ed Week. An Anchor Chart Mashup is from Two Writing Teachers. Infusing Information Writing Throughout the Day: Diving Into Information Writing is from Two Writing Teachers. Hochman’s ‘But, Because, So’ Sentence Expansion Activity is from Doug Lemov. 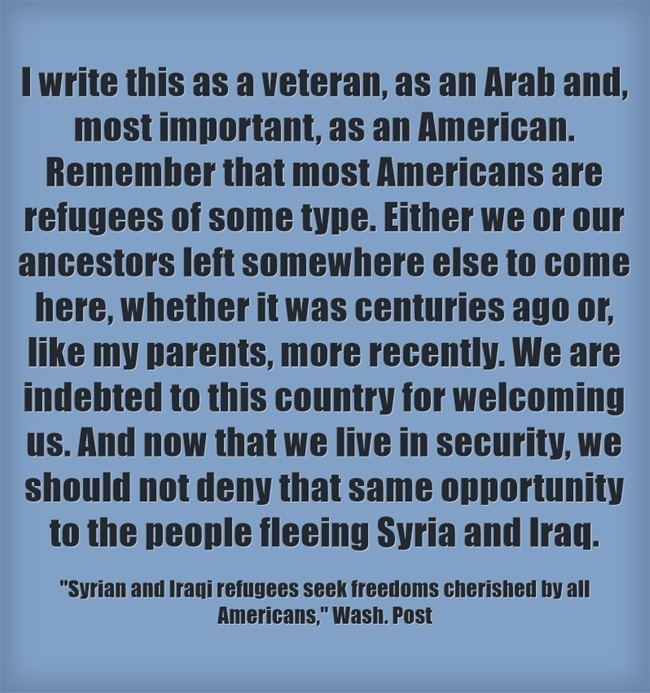 Syrian and Iraqi refugees seek freedoms cherished by all Americans is from The Washington Post. How does Khalil Tawil suggest the United States should respond to refugees? To what extent do you agree or disagree with what he believes? To support your position, be sure to include specific examples drawn from your own experience, your observations of others, or any of your readings. 5 Non-Negotiables When Designing Writing Instruction is from Three Teachers Talk. 10 Surefire Ideas to Remove Writing Roadblocks is by Regie Routman at Middleweb. On the Impossibility of Teaching Creative Writing is from The Huffington Post. Our 100 Most Popular Student Questions for Debate and Persuasive Writing is from The New York Times Learning Network. The University of New Hampshire has a lot of good Writing Hand-outs, particularly around grammar issues and writing particular types of essays. Mentor Text Dropbox is a site where you can find and contribute…mentor texts. Tools to Help Writers Explain Good Evidence is from Middleweb. I’m adding it to the same list. Teach Students to Write Strong Paragraphs is by Sarah Tantillo at Middleweb. What Does The Trump Campaign Teach Us About The Limitations Of The Common Core Standards? My students like Dance Mat Typing because it teaching typing with text and audio support. Typing Web is a great site for learners. You have to register for the site and it tracks your progress. UMaine Professor: Writing Boosts Performance of Maine’s Student-Athletes comes by way of the National Writing Project. In addition to the way I now work with our coaches, this idea might be worth pursuing. This crowdsourced collection of Doug Lemov-inspired “Confident Letters of Intent” (basically, academic sentence frames and starters) is fantastic. It comes to me via James Theobald on Twitter. Here’s an excellent post from the National Writing Project filled with resources for teaching a Writing Workshop model in class. Low-Stakes Writing: Writing to Learn, Not Learning to Write is from Edutopia. Getting Strategic About Teaching Revision in Writing is from Ed Week. 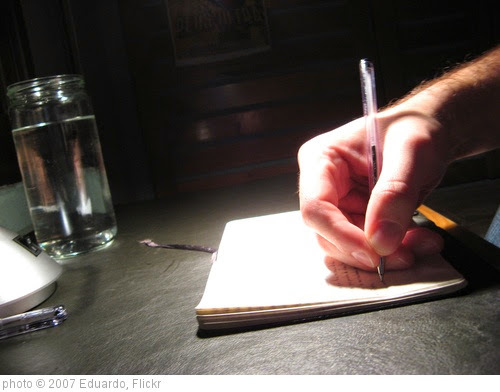 The Psychological Benefits of Writing Regularly is from LifeHacker. Students in My Math Classes Next Year Will Do a Lot of Writing. Here’s Why is from Ed Week. NEW BLOG SERIES: STARTING WITH WHAT MATTERS MOST IN WRITING WORKSHOP is from Two Writing Teachers. 3 Strategies to Fire Up Hesitant Writers is from Edutopia. Try This Teaching is a new website by Amjad Ali that contains useful teaching resources, like this On One Hand graphic organizer. How to give writing feedback to students efficiently is by Ray Salazar. The Writing Journey by Kelly Gallagher. 20 Things for Students to Do with Informational Text is from Julie Conlon. It includes a very nice infographic. What quality does the writer say is important in order to be an effective learner, and what is her justification? To what extent do you agree or disagree with what she believes? Write an essay responding to these questions; to develop your essay, be sure to include specific examples drawn from your own experience, your observation of others, or any of your reading — including “Learning To Learn” itself. Teaching writing = making a fire. You add firewood, but unless you leave space for air (choice, voice, play, pleasure) the fire won’t burn. 14 Questions for Examining Mentor Texts (Of Any Kind) is from Gil Teach. A Year of Picture Prompts: Over 160 Images to Inspire Writing is from The New York Times Learning Network. GETTING STARTED WITH MENTOR SENTENCES is from Ideas By Jivey and looks interesting. MENTOR TEXTS: WRITING WORKSHOP FUNDAMENTALS is by Kathleen Neagle Sokolowski. Writing Workshop Checklist is from Edutopia. Tips for Aspiring Op-Ed Writers appeared in The NY Times. A FRONT THE WRITING DISCUSSION TEMPLATE (AND THE FEEDBACK WE GOT ON IT) is by Doug Lemov. The Highs and Lows of Highlighting: How Google Docs Supports Writing Instruction is by Tan Huynh. DEVELOPMENTAL WRITING: ESPECIALLY USEFUL W SHORT ASSIGNMENTS & FAST REVISION is by Doug Lemov. 3 Techniques for Students Who Know What They Want to Say But Not How to Say it is from Moving Writers. A (Writing) Library of Possibility: Structure and Freedom is by Tricia Ebarvia. One Sentence at a Time: The Need for Explicit Instruction in Teaching Students to Write Well is by Judith C. Hochman and Natalie Wexler. 3 Tips for AP Lang Test Prep is by Tricia Ebarvia. Strategies to help students engage in daily writing practice is from Achieve The Core. Choose a main character and 9 other ideas for starting a story is from the journalism site Poynter. It’s one of several useful posts in their Help Writers series. The use of the word “might” helped students feel more comfortable about writing and less worried about being wrong. Is It Time To Go Back To Basics With Writing Instruction? is from MindShift. AT FIRST GLANCE: A SENTENCE STARTER ADDS UNEXPECTED RIGOR TO WRITING is by Doug Lemov. Micro-Writing for English Learners is the title of my latest article in ASCD’s magazine, Educational Leadership. Over 1,000 Writing Prompts for Students is from The New York Times Learning Network. The Action Behind Writing is from The Daily Write. 5-Minute Writing Conferences is from Edutopia. Nine Teaching Ideas for Using Music to Inspire Student Writing is from The NY Times Learning Network. Winners From Our Fifth Annual Student Editorial Contest is from The NY Times Learning Network. Why Teaching English Through Content Is Critical for ELL Students is from MindShift. The Warriors usually play very well in the 3rd quarter. Why? Halftime adjustments. https://t.co/jotjR9EXu1. This is a metaphor for young writers. They need mid-process coaching way more than they need comments on “final” drafts. Also, you might want to read Why Do the Warriors Dominate the 3rd Quarter? Consider Their Halftime Drill. FORMATIVE VERSUS SUMMATIVE WRITING PROMPTS-SOME EXAMPLES is from Doug Lemov. Stop Boring Nonfiction Writing. Save the World. is from Angie Miller at Middleweb. What Students Gain by Writing Together is by Jeremy Hyler, and appears in Middleweb. Fostering the Writing Identities of Teens in ELA Classrooms is from The National Writing Project. Welcome to the NWP Knowledge Base is also from The National Writing Project. What The Research Says: The 13 Most Effective Ways To Improve Children’s Writing. is from Literacy For Pleasure. Feedback That Saves Time, Improves Writing is by Sarah Tantillo at Middleweb. Paragraphs: Give Us a Break! is from Teach Write. ‘Not All Feedback Is Created Equal’ is a four-part series in my Education Week Teacher column. Strategies for Teaching Argument Writing appears in Edutopia. Writing is one of the most challenging skills to master. @michelleshory and I created this resource for all educators of ELLs. “BECAUSE, BUT, SO” GOES 2.0 WITH DIRECT QUOTATIONS is from Doug Lemov. Teaching Great Writing One Sentence at a Time is from The NY Times Learning Network. Feel free to offer links to your best posts (or pieces that others have written) on teaching writing….